If you are looking for a gift that will inspire and bring joy to any recipient, this beautiful calendar filled with melodic nature poetry and awe-inspiring poetry fits the bill. This is a unique 2013 calendar that anyone would be pleased to receive. Dec. 18, 2012 - PRLog -- Next time you are shopping for the perfect gift for anyone on your list – holiday or otherwise – consider a unique calendar sure to provide inspiration and enjoyment. Dawn Huffaker, author, and Marilyn Huffaker, photographer, have once again teamed up to produce a beautiful calendar of inspirational poetry and photos they call Nature Through Poetry. With 12 full color photographs illustrating 12 poems about nature based on an incredible appreciation for all of God’s glory, every month represents a cause for celebration at the joy this content will provide. What is perhaps most unique about this calendar is that it is produced by a mother-daughter duo. Dawn Huffaker has been in a wheelchair since the age of five and she suffers from a weakened immune system which doesn’t allow her much outside contact or the chance to leave her home in the mountains of New Mexico. All of the thought-provoking poetry included in the calendar is based solely on what she sees through the windows of her home. Her mother, Marilyn Huffaker, is an amateur photographer and her daughter’s biggest supporter. This very talented mother-daughter duo both live together in their home in southwestern New Mexico and worked closely together to produce a calendar of exceptional beauty, 2013 Nature Through Poetry. 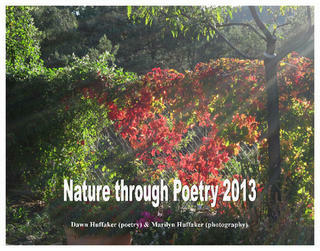 You can order copies of the 2013 Nature Through Poetry calendar now through the Lulu Marketplace at http://www.lulu.com/shop/dawn-huffaker-and-marilyn-huffaker/nature-through-poetry-2013/calendar/product-20472561.html. The calendar retails for $17.95. At eight months old, Dawn became mysteriously ill. From that point on, she never learned to walk on her own. By the age of five, her doctors had run every test available but still did not have a diagnosis for her condition, although they said it might have been polio or a polio-like disease. To this day, Dawn’s body is weakened, but not paralyzed. Dawn’s mother, Marilyn, wanted her to go to public school in a regular classroom. She always said that the only difference between Dawn and the other kids was that Dawn couldn’t walk – and she was right. In school, Dawn took classes from several English teachers who encouraged her love of writing. In 2006, Dawn became very ill, spending two months in a medical facility in Albuquerque. When she returned home, she was not able to return to work at her computer business. Dawn had a choice to make: to be a couch potato for the rest of her life, or explore her poetic voice. She chose the latter option and went on to write her first book of poetry, Flights of Fancy – Volume 1. From there, Dawn wrote another series of inspirational poems based on nature which was inspired by the photography of Michele Duncan, called Flower Escapes. In 2012, she and her mother, Marilyn, released the first Nature Through Poetry calendar and due to its phenomenal success decided to present a whole new collection of poems and photos in this year’s beautiful calendar. You can find all of Dawn’s products for sale on her Lulu page: http://www.lulu.com/spotlight/dawnhuffaker.